An attainable high horsepower outboard. The new 527 is an application engineered outboard designed specifically for the changing needs of big outboard boats. A premium outboard broadening access to the improved big boat outboard experience. 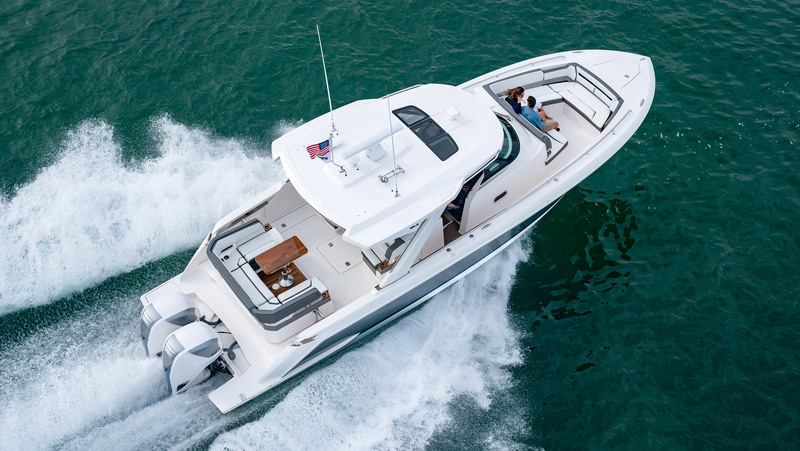 Capable of powering the largest outboard boats, the new 527 does not compromise. Reliability. Durability. Refinement. Power. This may just be our best outboard yet. The CR package optimizes the 527 for customers seeking maximum cruise efficiency and low speed control, with top speed targets less than 60mph. Long range cruising in outboard powered vessels with weights ranging from 20,000 to to 60,000 pounds is now a reality. All-new 1.91:1 gear ratio with the standard twin pinion single prop gearcase and all-new 2.55:1 gear ratio available with the optional CR package, the 527 transmits big torque into high thrust to carry big boats. Designed to stir emotion. Presenting the new multi-louvered cold air intake with improved air flow designed with Computational Fluid Dynamics (CFD) to provide high volume cold air flow to efficiently feed air to the supercharged V8 that lies within. New Quick-Start™ technology allows rapid automatic fuel system priming at the turn of a key. Sound designed specifically to provide big power with decreased noise levels. At the heart of every Seven is the supercharged small block V8.Luxurious performance – flawless idle, powerful acceleration, and more power than has ever been put under a cowl – the unmistakable V8 soul lives. Enhancements to the supercharger system drive colder air into the engine improving fuel economy and mid-range power. Using 316L stainless steel, one of the most durable corrosion resistant alloys ever engineered, the tubular design minimizes back pressure and optimizes performance while the dual wall section keeps temperatures cool. Eliminating corrosion and increasing performance at the same time seems logical to us. Lightweight helical gears quietly move diesel-like torque from the engine to the transmission. Precise gear ratio combinations allow the optimization of propeller and ratio to meet top speed, cruising and fuel economy targets. Seven’s third generation twin-pinion gearcase sheds frontal area and divides torque across two drive gears for durability, high-speed cruise economy, and class leading mid-range accelerations. 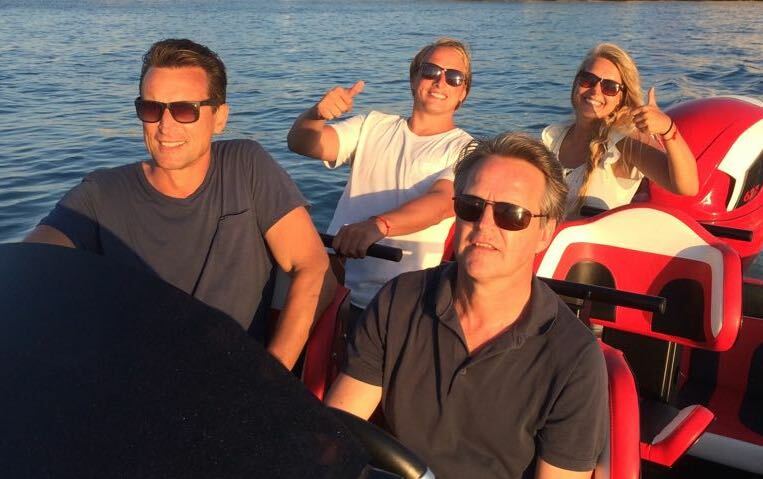 Maximum thrust to carry the industry's largest boats. The highest thrust propulsion system in the outboard business – the CR edition has two propellers in a contra rotating configuration. It is optimized for customers seeking maximum cruise efficiency, low speed control and top speeds less than 60mph. Engineering durability in starts by keeping the salt out. Closed loop cooling keeps the salt in the sea and out of the engine. Specialized coolant circulates through the engine keeping it cool and clean from the inside – anti-corrosion, lubrication, sea-water safe biodegradable. Fundamentally, a better cooling system. Super Console drivelines require purposeful designs for more torque. The ZF Marine transmission, with precision ground 90 degree spiral bevel gears, inboard style wet disc clutches, integrated trolling functionality and smooth progressive shifting, is built for precisely this type of application. 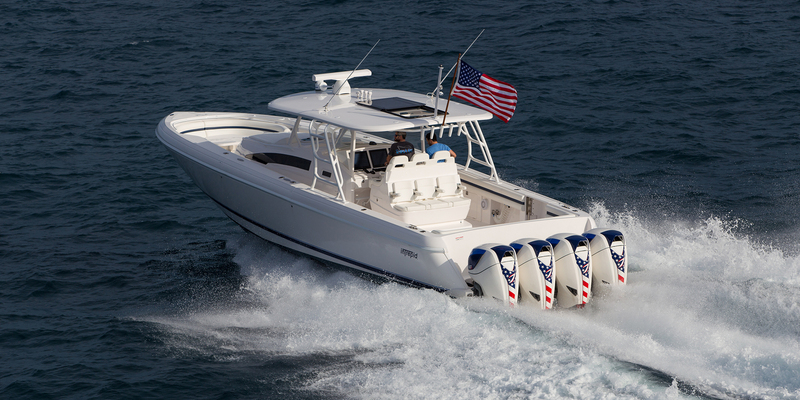 Big boat durability, outboard performance.